Taco Wontons came from having way too much odd food left over in my home. I used to threaten members of my family with something I heard about once. Prison loaf. You see Prison loaf is where you take all leftovers, combine them into a bowl, add some water and flour, and then pour into a greased loaf pan, and bake. My Taco Wontons, is a far step above Prison loaf. While I started my won tons with some already cooked taco meat, you can prepare yours with freshly made taco meat. You may even want to try my recipe for taco seasoning. Looking for more wonton inspiration? Check out these fun appetizer recipes. 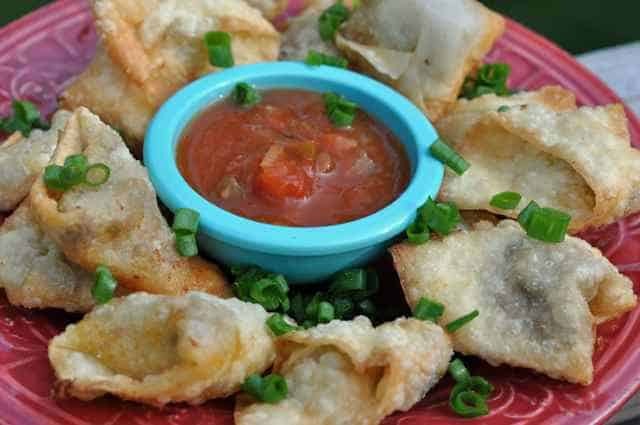 Enjoy these taco wontons, they make an amazing appetizer. Cook ground meat until done, add taco seasoning mix. Prepare an egg wash by combining 1 egg and 1 tablespoon of water in a small dish and whisk together well. In a large pot heat oil to 350 degrees. You can use a smaller pot and save on oil as well. I sometimes don't even bother with a deep fryer, I grab a 3 or 4-quart pot, add oil, fry in a normal everyday pot. To assemble the wontons take 1 wonton wrapper, about 2 teaspoons of ground meat and place into the wonton, fold the wonton wrapper over, brush the edges of the wonton with the egg wash, and fold over the wonton. Deep fry until golden and they float. The best judge for deep frying is the color and the fact that it is floating in the oil. Serve up your taco wontons with condiments that you enjoy. Shredded cheese over these and popping them into the oven and turning them into nachos is very popular at my house. So is dipping them into your favorite toppings. If you spray them with non stick spray when you bake them, they might be ok.
Just made these for lunch with melted velveeta as a dip! FABulous! Something you would see on a bar menu. I bet these would be good with a cheese dip! LOVE these Stephanie!!!! You are brilliant!